Memorial day is just around the corner and summer is approaching quickly. With all the rain lately, people are wondering if they are going to have to be changing their plans. Your plans will be dependent on El Nino and where you are at in the country. Some places have a cooler and wetter period, and some places will have a dryer summer. It depends where you are located. “I’m planning on being at the beach all summer so the weather better be nice or I’ll be really mad,” said Juan Cubano. With the oncoming El Nino event [it] suggests that the warmest part of the summer is more likely to be early, with generally cooler temperatures later in the summer, said Crawford. Eric Horst, Millersville meteorologist, said it’s was too soon to tell how the weather will look for Memorial day weekend. 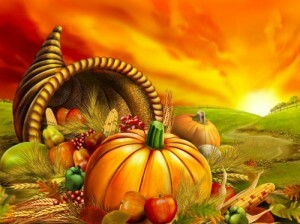 Hopefully it will be like last year’s with warm temperatures, and clear skies. “I hope it’s nice out memorial day weekend, I hope the weather doesn’t ruin my weekend at the beach with my friends,” said senior Marc Summy about his Memorial Day plans. Horst also commented that the weather will vary throughout the country, depending where you are at, or planning to go, your plans may change. “I’m planning on going to the mountains and canoeing about eight miles, so if it rains that will be a long canoe ride,” said Mackenzie Payne. “I hope our family picnic tradition continues like we were able to continue it last year with the nice weather,” said junior Jessica Hanner. The weather for this holiday weekend is still to be set in stone, but people are hoping for more consistent, and warmer weather for this coming holiday and summer. “Yeah we’re going to get snow,” said Dave Bender, Penn Manor science teacher and school weatherman extraordinaire. There is a winter storm warning in the Susquehanna Valley, according to Bender and other weather reporters. Snow is supposed to start at 2 am Saturday morning and keep snowing until 10 p.m. Saturday night. Anywhere from 4 to 8 inches of snow is expected. All sports and other activities in the district have been postponed. The snow is coming from the Tennessee Valley. The heavy wet snow will create slippery travel conditions for those planning to drive early in the morning or after dark. As for the winds: North about 5 to 10 10 MPH and gusts up to 25 MPH. Temperatures in the lower 30s. After four grueling days of school, the Labor Day weekend is finally here! The holiday will be fantastic because the weather will be mostly sunny. This Labor Day weekend’s weather will be very nice but a bit humid for the first three days. Look out for possible thunderstorms on Sunday. Friday will be humid with a high of 80 degrees and a few showers on Monday may ruin some Labor Day plans. Friday looks good for Penn Manor’s first football game. Fans will enjoy the summer temperatures. Although mostly glorious, this long weekend may include intervals of clouds and sunshine with a 30 percent chance of thunderstorms and showers on Sunday and Monday. Friday through Monday it looks like the humidity will be mixed with sun and clouds throughout the days with highs mostly in the 80s. Penn Manor Senior Chris Gotwals is hosting a family party and an all-day swim with friends. Later in the weekend, Chris is golfing with his dad and grilling out for Labor Day. “It’s gonna be gorgeous, but I’m having my plans, rain or shine,” said Gotwals. Another student, Penn Manor junior Jordan Machado said he is planning to go to Dorney Park Sunday. “Sunny, hot, unbreezy. I would love it,” he said. Delky Flores, a Penn Manor junior is hoping for good weather for First Friday. Penn Manor’s Angelica Cruz, a junior, plans to go to First Friday (in downtown Lancaster) and to other parties during the weekend. Although there is some chance of possible showers toward the end of the weekend, students should keep their heads up and enjoy the plentiful good weather that will be around. 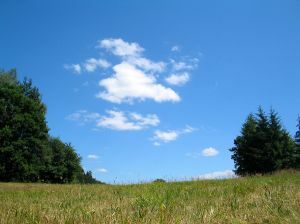 The fantastic memorial weekend weather has been a great change from the rainy months that we have been experiencing. Many people have been getting together enjoying the nice weather, having picnics and swimming. According to to Weather.com, Monday had a high of 91 degrees. But if you were outside yesterday it felt like a melting 97 degrees. Tuesday’s weather is supposed to hit a high of 92 degrees. Wednesday there is a chance of thunderstorms but may only reach 88 degrees. Thursday’s weather is predicted to be partly cloudy and a high of 88 degrees. Friday is supposed to be partly cloudy as well with a high reaching 78 degrees. Saturday and Sunday are supposed to be a high of 85 degrees but Saturday has a chance of thunderstorms and Sunday is supposed to be sunny and humid. Some people didn’t participate in any activities because it was so hot. “That’s the whole reason why I didn’t leave my house, because it was hot,” said senior at Penn Manor High School Emily Hess. “I stayed home and watched Netflix because it was so hot,” said Troy Diffenderfer a junior at Penn Manor High School. The hot air has been coming from a warm front from the bottom eastern region of the country and mixing with a cold front coming from the western region of the country. “It has been so hot the past couple of days I don’t feel like doing anything while the sun is out,” said senior at Penn Manor High School, Noah Kuhn. Pools just began to open over the weekend. Skyline pool charges $18 per person for non-residents and $13 per person for residents living in Manheim Township. Also, Lancaster County pool has opened up starting at $5 per person per day. A Millersville pool membership is $160 for a single person for a year and $250 for a household for an entire year. “My memorial day weekend was great except it was scorching outside and I needed to take a dip in the pool,” said senior at Penn Manor High School, Jeff Ford who has a pool in his backyard. 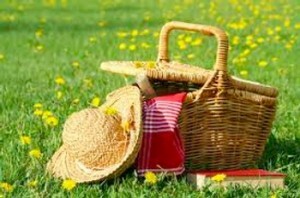 Picnics are also becoming a more common scene around because of the much better the weather is in general. “We had chicken, rice, burgers, hot dogs, chips, soda and steak. I ate a very healthy meal and right after that I went to sleep” said a freshman at Penn Manor, Antonio Vega. The beginning of that famous saying turned out to be true. Let’s just see how the predicate turns out. Throughout the last 30 days or so, there have been several days where it has done nothing but rain the entire day. In April it rains about 3.4 inches every week, but as of this year, we are above normal by 4 inches. “I hate the rain. It makes me feel like I’m moving rapidly slow,” said senior Henry Kohler. Many students miss school either because they are sick because of the weather change or just don’t feel like coming to school in the rain. Feeling like they are being “robbed of summer with all this weather issues that we are having, ” according to senior Noah Kuhn, is one of the many side effects found in the minds, immune system and sleeves – right after they wipe off their nose, that is – that are going around Penn Manor High School. There are many different medications that you can take to prevent some of the other side effects, runny, stuffy and itchy noses: Zyzal, Claritin D, antihistamines and decongestants. But with the weather being such a disaster, these medications are not going to work at such a fast pace. Rain has been prevalent over the past week, causing flooding in some areas and, an even more important problem, mold is starting to form. “Mold is so nasty it makes my stomach turn,” said Francisco Ramos. The green, fuzzy fungi is being seen in a variety of places because of the damp and wet conditions out in the environment. The flooding has caused more and more mold to grow throughout the Lancaster County region, which in turn, is adding up to the total amount of pollen that is being blown around throughout the day. “When it rains it makes me feel like I’m down and unable to do anything,” said Alyssa Figueroa, a senior. Children with allergies are bound to sneeze more than usual, and it also can cause problems breathing for people that have asthma. Every time someone breathes in air from a plant that they could possible allergic to, it could be the start of a very long relationship between the allergy sufferer and the sniffles. Also, recently there has been severe weather warnings, tornadoes and flooding. In fact, 2011’s month of April was the bringer of the most deaths ever from the natural disaster with the name derived from the Latin word, tonare. “It is crazy how we (might) get a tornado here in Lancaster,” said Kim Alexander. Pollens, mold and wet weather come with the package included that come with the fourth month of the year. With that comes sneezing, runny noses and more rectangular boxes with a white flag waving out of it and the letters K-L-E-E-N-E-X labeled on the front around the house. Penn Manor students will just have to live through these two months. Then, it’ll be summer’s turn to bring something of its own. Oh the Weather Outside is……Confusing. Monday sandals and short shorts, Tuesday umbrellas with a sweatshirt. Students at Penn Manor are going back-and-forth between their winter and summer wardrobes. It’d be lovely to ensure students that they can set out their cargo shorts, tank tops and sandals for good, but the next 5-7 days may “wash away” that thought. The inconsistent weather forecast for the next 5 days. Last week temperatures hit 79, and Wednesday snow appeared in some parts of the county. This week is just as odd. Yesterday, Lancaster hit a seasonal high of 84 degrees. Today’s weather is roaming in the 50’s with high chances of rain leading into the night. Tomorrow is gonna seem like Deja Vu. Most students and teachers in the building seem to have the opposite mindset. Sophomore Kyle Musser said, “I’m annoyed by the weather” which is forcing him to wear sweatpants and a sweatshirt. Millersville University Meteorologist Eric Horst has his own theory on the weather pattern. He believes it’s a pattern that has stayed consistent for the past 10 years, and always seems to fall around the end of March into the third week of April. “This roller coaster ride will continue for the next two weeks until around Easter weekend,” explained Horst, indicating the April 23-24 weekend. His predictions were enlightening with his promise of sunshine and high 60s for Thursday and Friday, but they were erased with his predictions of rainstorms for the weekend. One thing is for sure, this week is probably the start of a more unsettled climate to come. Sniffles and sneezes will be heard throughout the school as allergy season plagues many at Penn Manor. Spring is not the most pleasant time of year for allergy sufferers, but there are easy ways to find relief and bear through the harsh first months of Spring. School nurses evaluate students’ symptoms and have general information that they can share with someone who has allergies. “The student needs to be prepared – bring lots of tissues, drink lots of fluids, and take medications at home if their physician has recommended that they do so,” said Penn Manor school nurse Anne Butterfield. “We can notify a parent and ask that medication be brought in to help control severe symptoms,” she added. April and May are the height of the tree pollen season, and May and June are the height of the grass pollens. Allergy season provokes a lot of uncomfortableness to its victims. The overall quality of life is affected for sufferers with the most severe cases as the simplest activities become hard and annoying tasks to bare. Sleeping can become a pain during the peak allergy period as well as sports activities since athletes are outside for an extended period of time and are overexposed to the allergens. Symptoms of seasonal allergies include congestion, sneezing, rhinorrhea (runny nose) and itchy, watery eyes. It is important to distinguish the difference between the common cold and seasonal allergies as many of the symptoms are similar. To alleviate symptoms, sufferers can take control of environmental systems. Windows should be kept closed, laundry should not be hung outside and showers should be taken every evening so that allergens trapped in hair are thoroughly rinsed out. Complications of allergies include sinusitis, asthma , conjunctivitis (inflammation of the membrane lining the eyelids) and otitis (inflammation of the ear). In the coming months, when students and faculty at Penn Manor appear to be groggy and teachers seem to go through a box of tissues in half-a-day, it will be evident that allergy season has struck, but it’s reassuring to know that it will all soon be over. Spring arrived but it forgot to bring warmer temperatures. Now that the long cold winter is over and spring officially began March 21, you might think Mother Nature would be giving us lots of warm, sunny days. But it seemed that the first week of spring of 2011 seemed more like the first week of winter. “This year’s spring started pretty crappy. It is still cold,” said freshman David Carmichael. So far this “spring” the weather has been cloudy and rainy with highs barely into the 40s. Although a few brave flowers are peeking above the soil, blooms are still a rare sight. “The weather feels like winter,” said freshman Ricky Reveron. According to WGAL.com, not only it is supposed to rain this week but they are also calling for chance of snow on Sunday. Winter may almost be over, but the effects of big storms in the past weeks can still be felt in the Penn Manor parking lot. Even three weeks after a big snowstorm hit Lancaster, people still can’t park in their own spots. Cade Murry, a senior at Penn Manor High School, is still waiting for his parking spot to be cleared. Recently a few students from the Ag department at Penn Manor took matters in to their own hands and plowed open a path on the sidewalk because it was plowed shut. One other problem students encounter is how slippery it is on the parking deck. Dan Short, who drives a rear-wheel drive sports car, said he has trouble on those snowy mornings coming to school. “I only drive my car sometimes to school because I know I will have trouble,” Short said. Snowy mornings are hard to predict, and for the Janitors and Dr Jason D’Amico, who’s in charge of the parking lot and passes at Penn Manor High School, it’s even harder to predict when to get here to start clearing the snow. The Janitors are in charge of all the sidewalk clearing and stairs at Penn Manor. 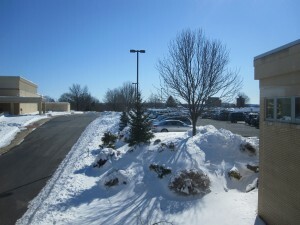 The Grounds Maintenance Crew clears the parking lots from snow. With the amount of snow the Susquehanna Valley has been getting, there are certain things that are just inevitable. “After last year’s snow, (the Janitors) have it all their shifts and clearing down to a science,” D’Amico said. The recent snow storm caused a 2 hour delay on Monday for Penn Manor. Students were welcomed by ice covered parking spots and unploughed sidewalks. The previous week showed more favorable weather in the mid 60’s, which can mean only one thing.